Recent epidemiologic and demographic public health data highlight the growing need for emergency medicine (EM) services in India and highlight its importance as a recognized medical specialty. Developing a comprehensive and recognized EM program for training physicians in India is of utmost priority and should not be neglected at any point of time. This review article attempts to highlight the development of a post-graduate program in EM in the country. Emergency medicine (EM) is a recognized medical specialty in over 60 countries, and this is growing in low and middle-income countries. Recent epidemiologic and demographic, public health data highlight the growing need for EM services that can include management of trauma, acute care and pediatric emergencies. Many low-and middle-income countries are devising EM training programs to address the needs of local communities who increasingly desire these services on a round-the-clock basis to help stabilize and dispose of patients as per their medical needs. Currently in India, a few hospitals have well-structured EM departments, but they often still want for formally qualified EM faculty. Medical emergencies are usually managed by residents pooled from other various specialties, such as General Surgery or Medicine, and initial assessment and a plan-of-care for the patient can vary depending on which specialty doctor is called when a patient presents. External issues such as lack of infrastructure, manpower, and equipment and training facilities further compound the challenge of managing emergency care. As the establishment of Emergency Department (ED) in various public and private hospitals is increasing in India, the need for physicians specifically trained in EM is also accelerating. Developing a comprehensive and recognized EM program for training physicians in India must occur simultaneously to meet demand for emergency care services. In India, EM is a nascent specialty and there are very few formally trained emergency physicians, and most EM physicians are concentrated in institutes that have supported EM's growth. In many of the hospitals the services provided are called "Casualty Centers" and often are staffed by junior physicians who usually do not have specialty qualification in EM. Additionally medically staffed ambulances, which provide pre-hospital care, are often privately owned and operate on a fee-for-service basis that is often not coordinated within the operational or catchment area. 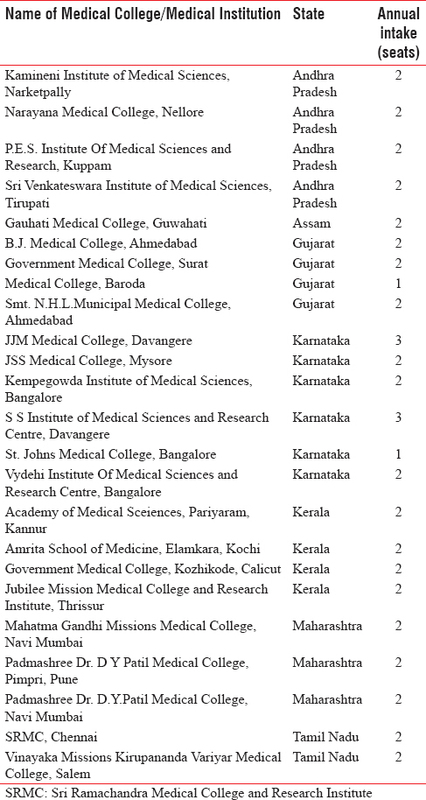 Figure 1: Total number of postgraduate seats in Medical Council of India recognized colleges. In addition to above, certain foreign universities like George Washington University, Washington and UpState Medical University, New York have also been running PG training programs in EM in the country. The scope for growth of EM in India is quite large and this relatively new service line needs to be carefully managed in order to fully take-off and meet the needs of the Indian population. India has a significant requirement for EM services due to the high prevalence of infectious diseases, symptoms resulting from chronic diseases such as complications from diabetes, cardiovascular disease, and traumatic injury. At present, the lack of an appropriate referral system in India results in many patients presenting at secondary and tertiary care emergency care centers, and as a result these EDs are crowded and over-burdened with problems, which can be better managed at out-patient care settings. Better coordination of care and explaining to the public what truly constitutes a medical emergency needs support from all levels of government as well as the hospital and doctors who provide care. Figure 2: Emergency medicine development pyramid. 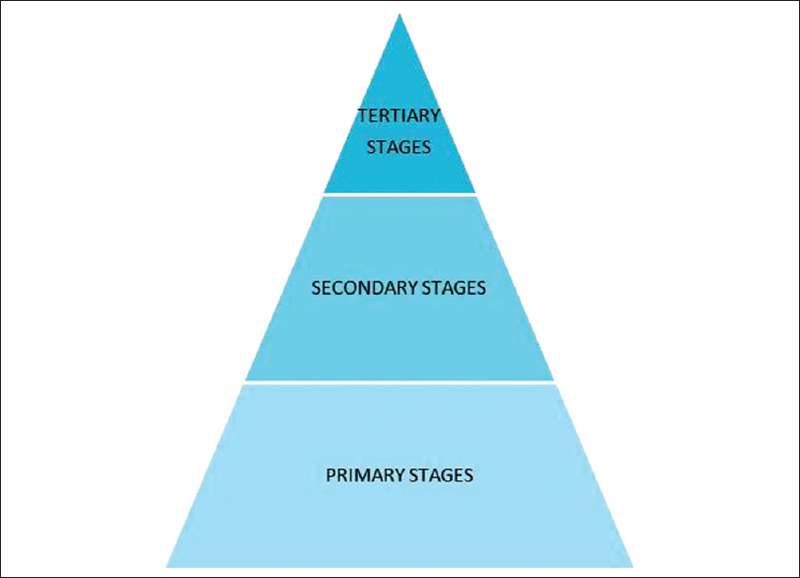 Stage-I or primary development consists of academic and clinical EM and patient care systems development. This will result in upgrading the present causality departments into well-equipped and autonomously functioning ED manned by trained emergency physicians (EP). Stage-II or secondary development involves administrative and managerial training, financial and economic systems development, reimbursement and systems analysis. Stage-III or tertiary development looks at macro issues such as health legislation, health policy, public health systems/agendas, patient safety and acute healthcare as a human right. Development of these three stages overlap, and ideally should run concurrently. Though the development of EM has broad similarities all over the world, blind adoption without validation in the Indian population will be unsatisfactory, given India's unique epidemiology, geography, and cultural and economic diversity. Program development in EM, accreditation for faculty development. 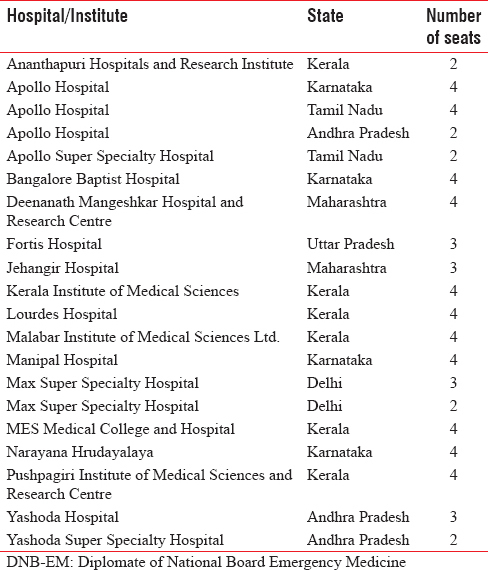 The National Board of Examinations at present offers 66 seats in DNB-EM at 20 institutions across India as shown in [Table 4] (as in November 2014). The introduction of EM can help make healthcare services more accessible and inclusive for patients and create job opportunities in the field of EM including new roles for doctors, nurses and allied health professionals. Need of nurturing as a "specialty of medicine"
Available from: http://www.ifem.cc/About_IFEM.aspx. [Last accessed on 2014 Dec 04]. Alagappan K, Cherukuri K, Narang V, Kwiatkowski T, Rajagopalan A. 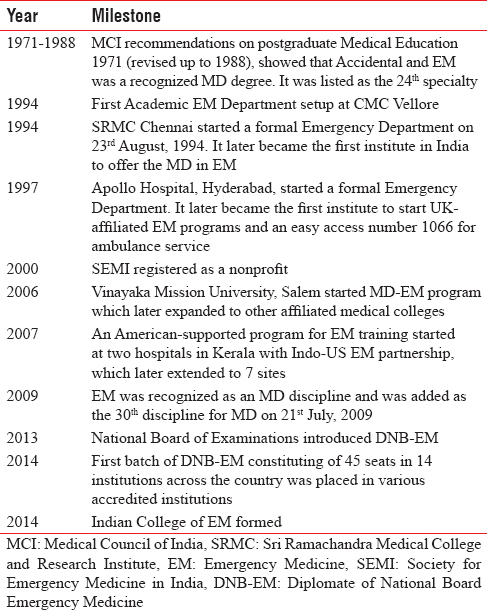 Early development of emergency medicine in Chennai (Madras), India. Ann Emerg Med 1998;32:604-8. David SS, Vasnaik M, Ramakrishnan TV, Emergency medicine in India: why are we unable to ′walk the talk′? Emerg Med Australas. 2007 Aug;19(4):289-95. Available from: http://www.mciindia.org/InformationDesk/CollegesCourses Search.aspx. [Last accessed on 2014 Dec 08]. Mulligan T. ED Development in Netherlands, Emergency Physicians Monthly; July 20, 2010. Das AK, Gupta SB, Joshi SR, Aggarwal P, Murmu LR, Bhoi S, et al. White paper on academic emergency medicine in India : I0 NDO-US Joint Working Group (JWG). 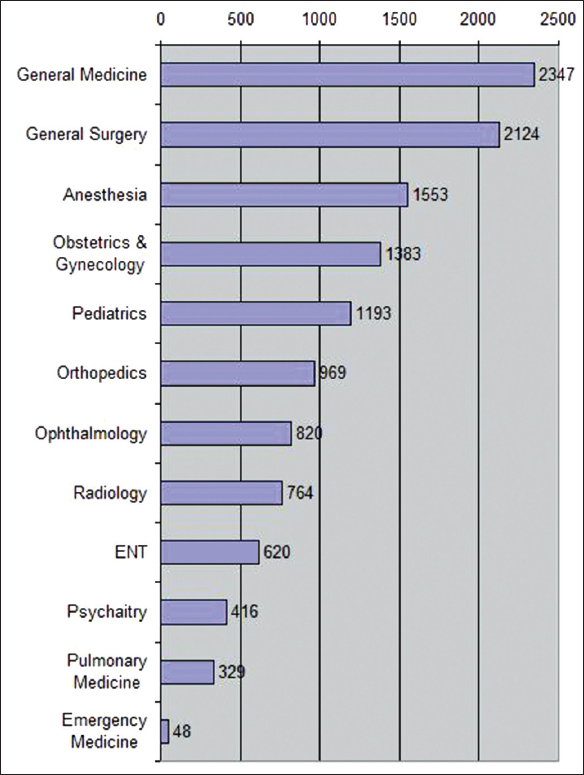 J Assoc Physicians India 2008;56:789-98. Subhan I, Jain A. Emergency care in India : t0 he building blocks. Int J Emerg Med 2010;3:207-11. Rajavelu P, Rajagopala A. Need for Epidemiology for Indian EM: An Evidence Based Approach, EMS India. Available from: http://www.emergencymedicine.in. [Last accessed on 2014 Dec 04]. Emergency Medicine-Programme Development by NBE: Report of Consultative Meeting.